Sad... I really liked this actor! R. Lee Ermey, the actor best known for his role as Gunnery Sergeant Hartman in “Full Metal Jacket,” died Sunday from complications of pneumonia. Ermey, who typically played military roles in movies, enlisted in the Marine Corps at just 17 after his second arrest for criminal mischief. He spent 14 months in Vietnam beginning in 1968 before moving to Okinawa. He was eventually given a medical discharge in 1972. While studying at the University of Manila in Philippines, Ermey was cast as a chopper pilot in “Apocalypse Now,” where he also served as a technical adviser to director Francis Ford Coppola. But Stanley Kubrick was the first to see Ermey’s true on-screen potential. After being hired as a technical adviser for “Full Metal Jacket,” Ermey was instead moved to a speaking role after proving just how well he could yell at subordinates. “I'd say fifty percent of Lee's dialogue, specifically the insult stuff, came from Lee. You see, in the course of hiring the marine recruits, we interviewed hundreds of guys,” Kubrick told Rolling Stone in 1987. In 2015, the Outdoor Channel launched “Gunny Time,” “a fully immersive host-driven television series focusing on weapons and weapons technology past, present and future” hosted by the actor. Thirty years after leaving the Marine Corps, Ermey received an honorary post-service promotion to gunnery sergeant for his continued support to Americans in the military. In recent years, Ermey, an NRA board member, claimed he had been blackballed by Hollywood for his disapproval of President Obama. Well that's a shame, he was a damn fine drill instructor. Vince Vaughn is my second fav in the role (Hacksaw ridge). It's funny how he got blackballed by hollywood for his disapproval of Obama's administration once, yet nowadays every hollywood award show is practically a 3 hour Trump joke show. I know Trump is a gold mine for comedy material, and he practically contradicts himself with almost every tweet he posts, but it kinda shows the double standard to consider a taboo thing when someone makes fun of an administration, but only when its the president that suits you. Pretty sure they also blackballed an actress in the past for making fun of Harvey Weinstein. Agree, he was really good in Hacksaw ridge! 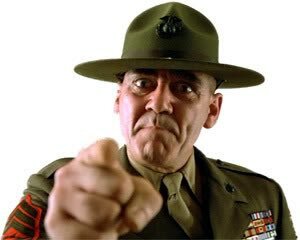 Ermey definitely holds the throne for best drill instructor role ever. Ad libbing that entire scene is just miles above the rest. Wasn't he in Mississippi Burning as well? Shame, I really liked the guy. I watched an interview with Vince Vaughn on his character role for Hacksaw Ridge, and yes he was inspired by Ermey. Still one of my favorite scenes! You will be missed!